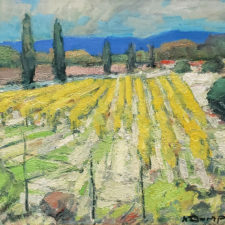 Consigned to American Legacy Fine Arts; private collection, Pasadena, California; Mutual Savings, Pasadena, California per art consultant who acquired the painting presumably from the Artist. The painting was displayed at the former headquarters of Mutual Savings located on Colorado Blvd in Pasadena, California, from circa 1965 to 1993. 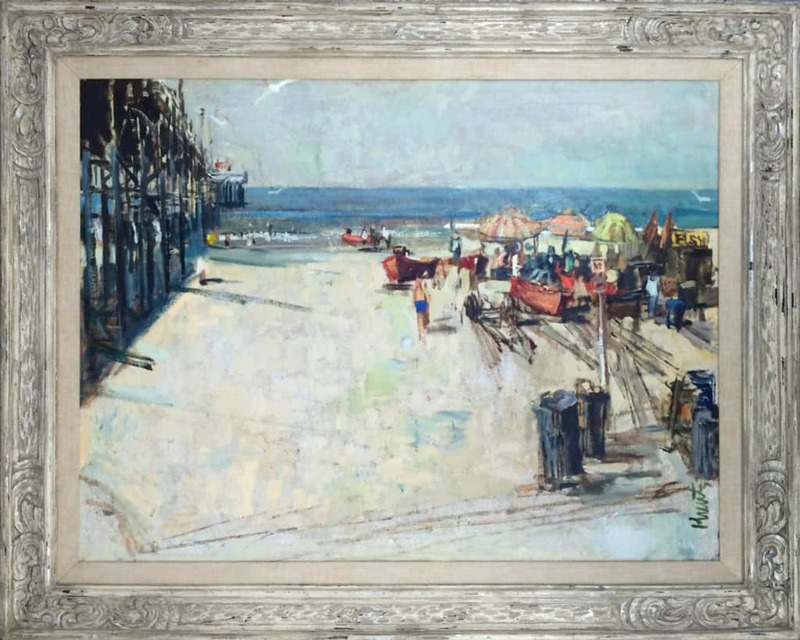 The work is a genuine mid-century painting and is in excellent condition with beautiful color. 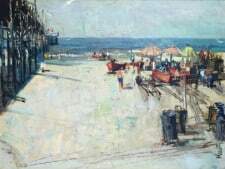 The scene depicts an identifiable location, Newport Pier at McFadden Place, in a classic vintage/festive California subject matter. The painting is in an original period frame, as selected by the artist. Roger Kuntz: The Shadow Between Representation and Abstraction was named by Los Angeles Times art critic Christopher Knight as one of the top 10 most fascinating museum exhibitions in the nation for 2009. When Life magazine did a special issue on the state of California in 1962, it focused on five artists: Stanton Macdonald-Wright, John McLaughlin, Robert Irwin, Billy Al Bengston, and Roger Kuntz. 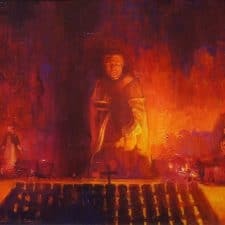 While four of these artists remain central to our understanding of the history of California art and have received numerous monographic exhibitions, little has been written on the art of Roger Kuntz. 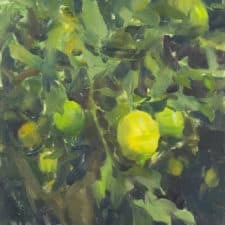 Roger Kuntz: The Shadow Between Representation and Abstraction, an exhibition of some seventy paintings, drawings, and sculpture organized by Laguna Art Museum, was the first major showing of the artist’s work since his death. It focused on Kuntz’s search for what he called the middle ground between figurative and non-figurative painting. By about 1950, Kuntz believed that post-war abstract expressionism had run its course and that the time was ripe for the reappearance of structure in art that communicated to the viewer. 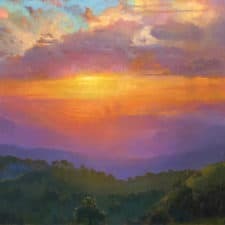 Kuntz embarked on several painting series, culminating in the nationally acclaimed Freeway series. These bare geometric paintings, dated 1959 to 1962, of concrete canyons, underpasses, ramps, pedestrian spirals, tunnels, and signs carved in deep shadow and light, embodied Kuntz’s search for the union of formal abstraction and mundane reality. This stylistic shift away from gestural abstraction was in synch with the times and Kuntz was included in the first national survey of Pop Art organized by John Coplans, editor of Artforum magazine, in 1963. The Shadow Between Representation and Abstraction placed Kuntz’s work in a national context and explored his role in the Southern California art scene of the 1950sand 1960s. The exhibition featured the Freeway series as well as a selection from the artist’s interiors, beach scenes, signs, bathtubs, blimps, and tennis series. Kuntz lived in Laguna Beach from 1964 until his death in 1975 at the age of 49. A 112-page, hardcover, color catalog with an essay by guest curator Susan M. Anderson and an introduction by Peter Plagens accompanied the exhibition. Plagens, an artist and former critic for Newsweek magazine, observed the vital postwar art scene in California first hand. He is the author of Sunshine Muse, the definitive survey of West Coast art from 1945 to 1970.